The whole plants can be regenerated virtually from any plant part (referred to as explant) or cells. 1. Selection of suitable explants like shoot tip, leaf, cotyledon and hypocotyls. 2. Surface sterilization of the explants by disinfectants (e.g. sodium hypochlorite) and then washing the explants with sterile distilled water. 3. Inoculation (transfer) of the explants onto the suitable nutrient medium (shootregeneration medium, which is sterilized by autoclaving or filter-sterilized to avoidmicrobial contamination) in culture vessels under sterile conditions (i.e., in laminar flow cabinet). 4. Growing the cultures in the growth chamber or plant tissue culture room (Fig. 2A), having the appropriate physical conditions [i.e., artificial light (16 h photoperiod), temperature (~26oC) and relative humidity (50-60%)]. 5. Regeneration of shoots from cultured plant tissues and their elongation. 6. Rooting of regenerated shoots on rooting medium. 7. 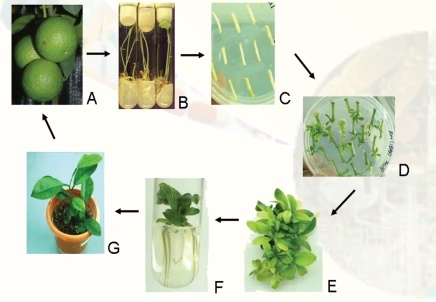 Transfer of plants to the transgenic green-house (Fig. 2B) or field conditions following the acclimatization (tissue hardening) of the regenerated plants. The in vitro culture of plant parts or cells require a variety of nutrients and suitable physical conditions, unlike the intact plants which can synthesize their own food and many other essential compounds needed for their growth and development using light, CO2, water and minerals. The composition of plant tissue culture medium can vary, depending upon the type of plant tissues or cells that are used for culture. The typical plant tissue culture nutrient medium consists of inorganic salts (both micro- and macro-elements), a carbon source (usually sucrose), vitamins (e.g. nicotinic acid, thiamine, pyridoxine and myo-inositol), amino acids (e.g., arginine) and growth regulators (e.g. auxins, cytokinins and gibbrellins). Other compounds like casein hydrolysate, coconut milk, malt extract, yeast extract, tomato juice, etc. may be added for specific purposes. Plant hormones play a pivotal role in growth and differentiation of cultured cells and tissues. An optimum pH (usually 5.7) is also very important. There are two kinds of media - liquid and solid media, and in the later case a gelling agent such as agar (a polysaccharide obtained from a red algae,Gelidiumamansii)is added for solidification ofthe medium. There are several types of media like MS, LS, B5 and Nitsch's medium, and the choice of media is dictated by the plant species, variety or plant part. However, the most extensively used nutrient medium is MS medium, which was developed by Murashige and Skoog in 1962. The success of plant regeneration from cultured cells and tissues are largely governed by the composition of the culture medium. The sterilization of nutrient media by autoclaving or membrane filter-sterilization is utmost important to avoid microbial contamination. Organ culture: It deals with the culture of the isolated organs (like roots) under laboratoryconditions (in vitro), and different names are given depending upon the organ utilized for the culture. For instance, the culture of roots, endosperm, ovary, ovule and anther are called as i) Root culture, ii) Endosperm culture, iii) Ovary culture, iv) Ovule culture and v) Anther culture respectively. Explant culture: The culture of plant parts (explants) is known as explant culture. The explantscan be any part of the plant like the piece of stem, leaf, cotyledon, hypocotyls, etc. The explantcultures are generally used to induce callus or plant regeneration. • preparation of the single cell suspensions and protoplasts. • induction of somatic embryos/shoots. • in vitro mutagenesis and mutant selection. • production of secondary metabolites. Mass cell culture: It involves the large-scale culture of cells in specially designed 'plantbioreactors', which essentially do not have a stirrer (as plant cells are shear sensitive). In place of stirrer, gas is gently bubbled, which provides stirring as well as meet the demand of a higher oxygen supply. Mass cell cultures are ideal for producing pharmaceutically important secondary metabolites. • Various biochemical and metabolic studies. • Fusion of two somatic cells to produce somatic hybrids. • Fusion of enucleated and nucleated protoplasts to produce cytoplasmic hybrids (Cybrids). Protoplast fusion: The protoplasts from two different plant genotypes can be fused in thepresence of fusogenic agents like polyethylene glycol (PEG - most widely used and most successful method for protoplast fusion) or by electro-fusion. The hybrid cells (heterokaryons) can be selected by various methods such as the use of different antibiotic markers or fluorescent dyes for two different protoplasts. Then, regenerated somatic hybrids from hybrid cells are characterized by morphology and molecular analysis (e.g. RAPD). This technique offers a unique method to raise new genotypes (i.e. somatic hybrids between distantly related plants or cybrids) with useful agronomic traits. The plants can be regenerated by either organogenesis andsomatic embryogenesis. Organogenesis means formation of organs like shoots from the cultured explants (Fig. 3C). Millerand Skoog experimentally proved that formation of shoot or root first on the cultured tissue depends on the relative concentration of auxin and cytokinin. If auxins are high in the medium, then it promotes rooting while if cytokinins are high, shoot formation is promoted. In somatic embryogenesis, the totipotent cells may undergo embryogenic pathway to form somatic embryos (Fig. 3D-G), which can be grown to regenerate into complete plants. Generally, somatic embryos resemble the zygotic embryos (seed embryos) except in their place of origin and larger size. For the first time, Steward in 1958 and Reinert in 1959 independently reported the somatic embryogenesis from carrot cultures.